Date Cake with Vanilla Chantilly - best saved for last! 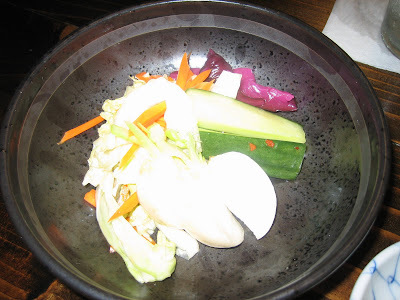 Last week I attended a media dinner at The Shed at Glenwood. We started with a wonderful foie gras torchon with blueberry jam on country bread and a tasty chicken liver & bacon bruschetta. I would order the foie gras again any day. After sitting down we were served watermelon sorbet as an amuse bouche. This was a bit strange to me as such a sweet sorbet seems more fitting as an intermezzo between the appetizer and entree courses or as a dessert. 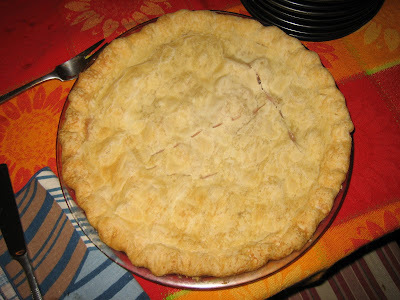 Still, I really enjoyed the concentrated watermelon flavor and ate every bite! The following photos are highlights of the meal. 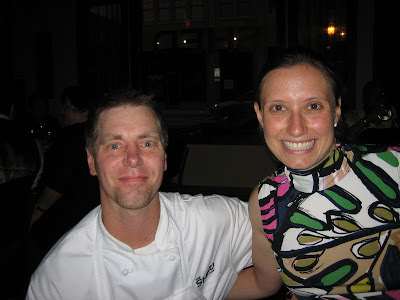 Yours truly with Chef Lance Gummere. Roasted Beet Salad, Goat Cheese, White Balsamic. I usually love beet/goat cheese salads but I think the white balsamic overpowered this one and the cheese was not strong enough to compete. I'd like to see a more flavorful goat cheese paired here and the white balsamic toned down a bit. 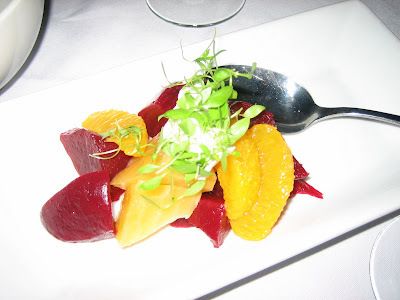 Still, I really enjoyed the yellow beets' wonderful flavor. Watermelon salad, Feta, Aged Balsamico. 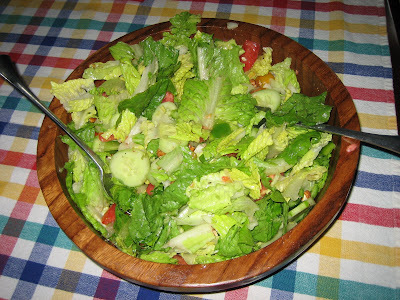 This salad really worked well. 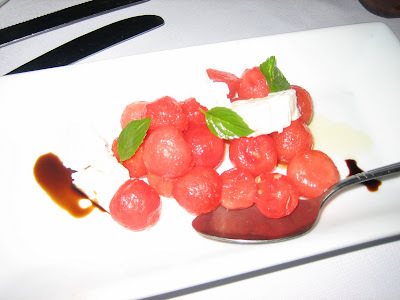 I loved the pairing of the feta and watermelon here and the balsamico and mint added nice extra touches. A bit more mint would have been welcome, maybe even chopped and tossed with the melon prior to plating. 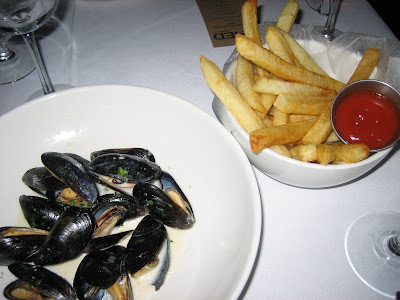 Steamed Mussels, White Wine, Garlic, Cream with Frites. Loved these mussels. Great flavor - a shame there was no bread for sopping, although I'm sure I could have asked for some. I was trying to save room for everything coming up! 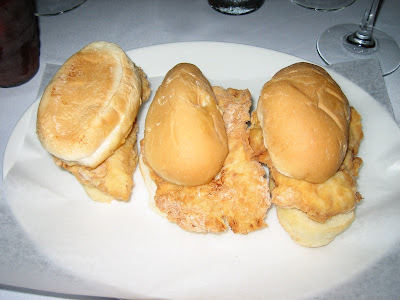 Fried chicken sliders - we also tried housemade pastrami and pork schnitzel sliders. After hearing so much about Wednesday slider night, these were a disappointment, although I did like the pork schnitzel one quite a bit and the pastrami was tasty. The problem seemed to be an unevenness of saucing and a lack of other condiments - no tomato, lettuce or other inventive toppings? The bread was also rather thick and made these taste dry. I wish we could have tried the scallop sliders with jalepeno slaw. 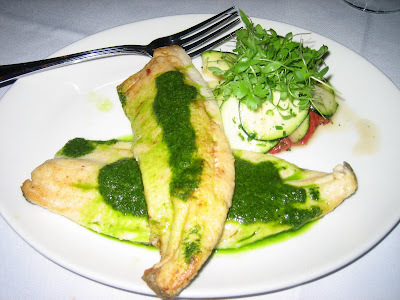 Pan Seared Trout, Crystal Farms Organic Summer Squash, Pesto. I really enjoyed this lighter dish, especially the squash and pesto. The fish was tasty but did not blow me away. Perhaps I have been spoiled eating fresh mountain trout in NC. Ribeye, Jumbo Lumb Crabmeat, Roasted Sunchokes. 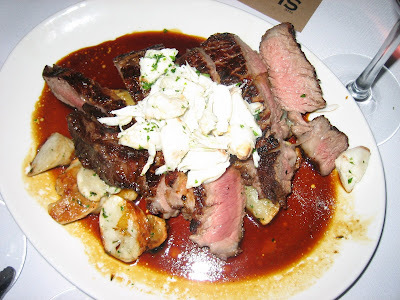 The steak was okay (I am not a huge read meat fan) and the crabmeat is an interesting touch, but the sunchokes (AKA Jerusalem artichokes) blew me away. I never had these before and they were so tasty - like a combination between an artichoke and a potato. I want to find out where to buy them so I can cook them myself. Definitely a great idea to include them in this dish, giving it a uniqueness unusual to beef entrees. We also tried a chicken dish, which was juicy and tasty, but not really what I go to restaurants to order. I would have enjoyed trying one of the more unusual entrees on the menu like the swordfish or the pork dumplings rather than chicken, but those who like to order chicken out will enjoy this well-executed dish. I preferred the date cake (first photo) although I think the ding dong is a cute idea. It didn't really taste as rich or flavorful as I expected. We also tried the chocolate peanut butter bar, which had dark chocolate layered with peanut butter. 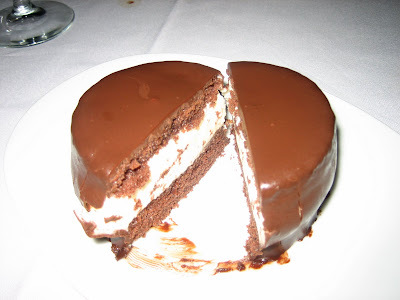 The dark chocolate was a bit overwhelming for this dish and although I prefer it to milk, it seems like a milkier chocolate would have worked better. I was disappointed we did not get to try any ice cream (especially since it was about 95 degrees out) - the profitoroles with espresso ice cream I saw on the specials board sounds like a winner. 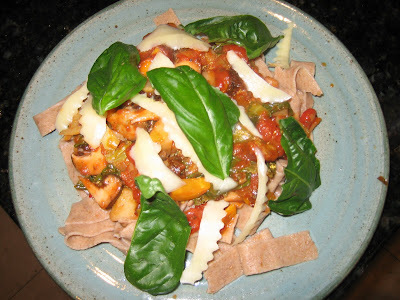 The finished product - spicy ratatouille sauce over Trader Joe's whole wheat pasta with freshly grated Bulgarian cheese and locally grown basil. I continue to have a great time experimenting with the items provided in my CSA (community supported agriculture) bag each week. One evening last week I made the above pasta while Calvin made oatmeal cookies (see dough bowl below). Both turned out really well. I am making an effort to cook more and eat out less, as I actually enjoy both equally when I'm in the mood! 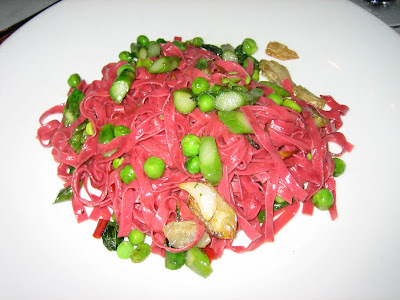 I also made a wonderful spicy peanut soba noodle salad with chicken and vegetables (sorry, no photo!) this week. The secret's in the sauce and while I do not have exact measurements I mixed several tablespoons of peanut butter with soy sauce, rice vinegar, sesame oil, fish sauce, sriracha and spices. To get the peanut butter to mix well, heat it in the microwave for a few seconds. Then I poured the sauce over cooked soba noodles, chopped cooked veggies and chopped leftover grilled chicken - it really did turn out well. Also, our CSA bag sometimes contains chevre (very mild goat cheese) from Decimal.Place Farm. I usually mix the chevre with spices and chopped sun dried tomatoes to make a tasty appetizer served with bread or crackers. This week I melted some chocolate chips and mixed the chocolate with some of the chevre. I make a graham cracker crust in a ramekin and dumped the chocolate/cheese mixture on top. Unfortunately we ate it too quickly for a photo, but this was another great use for the chevre. I look forward to trying more new recipes soon. 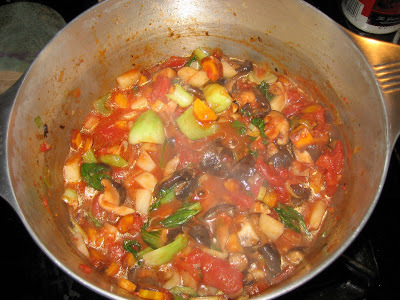 Spicy ratatouille pasta sauce including bok choi, carrots, mushrooms, canned tomatoes, fennel, diced Thai chiles & TJ's arrabiata sauce. 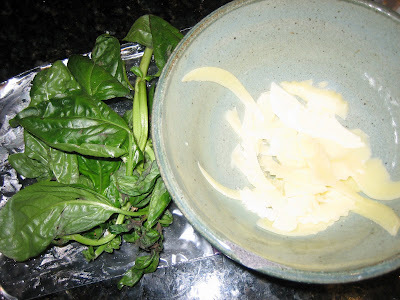 Toppings for the pasta - fresh basil from Small Farms CSA and grated Bulgarian cheese from the Buford Highway Farmer's Market. 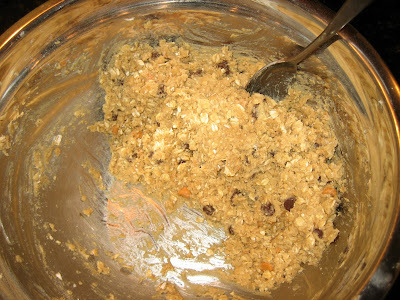 Calvin's cookie dough (Quaker recipe with chocolate chips and butterscotch chips instead of raisins; omit the cinnamon) - the cookies turned out perfectly. On Saturday night we had a wonderful meal at home including barbecued chicken and ribs from the Ole Smokehouse in Charlotte. Although the restaurant has a faded interior, I still remember fondly the weekly Thursday night meals I had here with my father growing up. We each always ordered the same thing: 1/4 BBQ chicken white meat, salad with homemade Greek dressing and blue cheese dressings on the side (had to mix the dressings), baked potato and hush puppies. The Smokehouse serves a fabulous BBQ sauce, which is sweet and spicy and goes great with almost everything. I used to slosh it all over my potato and hush puppies as well as on the meat. The secret to the meats is an old Chinese smoker oven, on display down the hall past the restrooms at the Montford Drive location. 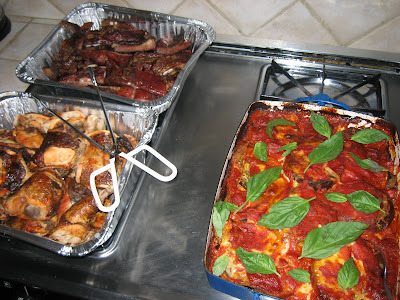 Chicken and ribs from the Ole Smokehouse and Dad's delicious eggplant Parmesan. Lynn's creative and tasty salad. 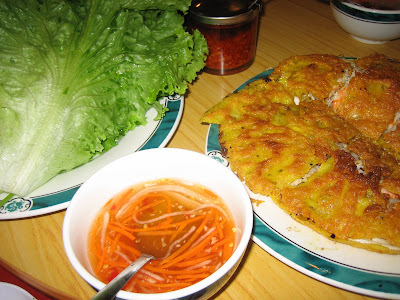 Banh Xeo - yellow pancake stuffed with shrimp, bean sprouts and pork. 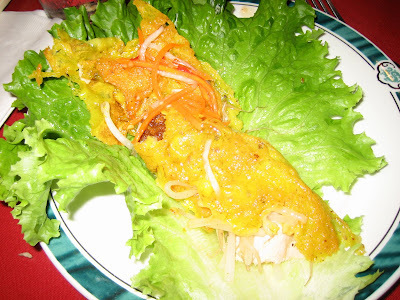 You wrap the pancake in the large lettuce leaf and pour the spiced fish sauce over it. For Father's Day weekend I headed to NC to see my father, as well as my aunt (visiting from El Salvador), my uncle and aunt (visiting from Boston), cousins (visiting from Chapel Hill) and more cousins (also from Atlanta. 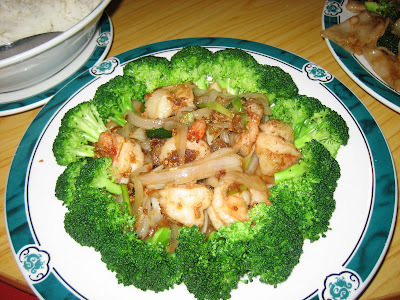 We had a great time, beginning with a feast Friday night at Saigon Palace, one of my favorite Vietnamese places in Charlotte. Overall this place is great because there is never a problem getting in with a large group and the service is nice. The food is not as good as a couple of other Charlotte Vietnamese spots (like Lang Van, one of my all time favorite restaurants), but the banh xeo is a winner and overall it's a fabulous, low-key spot for a group interested in talking and eating rather than being with the "in-crowd". 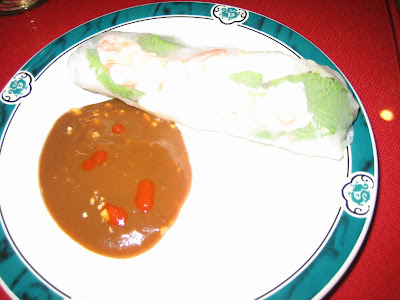 Fresh spring roll with peanut sauce and sriracha. Banh Xeo - ready to eat! 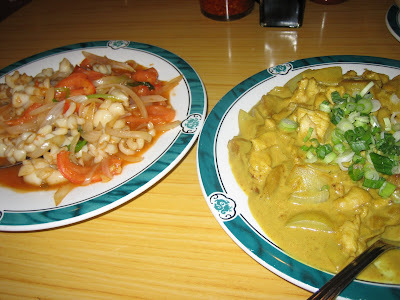 Squid sauteed with tomatoes and onions (left) and Vietnamese curry with chicken. 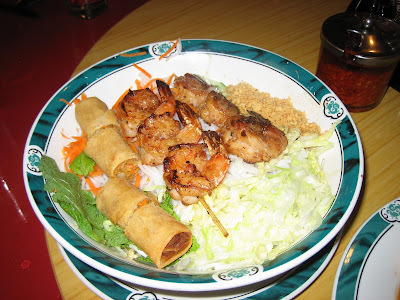 Vermicelli noodle bowl with shrimp and spring roll. Frozen grapes presented with the check - a unique touch. 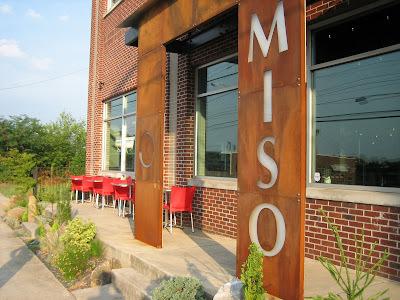 I finally tried Miso Izakaya after reading many reviews. Miso. located on the newly trendy Edgewood Avenue, dubs itself a Japanese gastropub and their drink list and liquor selection look great. The menu is currently different from the version on the website, with some dishes gone and others added. My favorite dish was the agedashi tofu - simple and delicious - although the chocolate cake with green tea ice cream was a close second - very tasty. The sushi was a dissapointment, especially the spicy tuna roll, which was mostly rice. 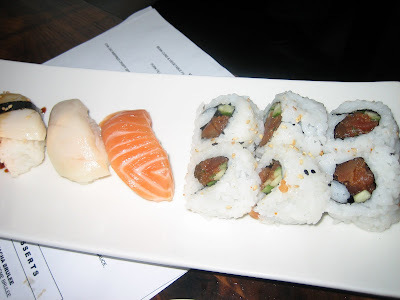 The salmon (my favorite sushi) was also not very tasty, although the white tuna and scallop were decent. 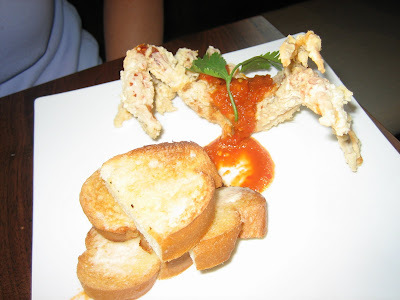 The soft shell crab had a dramatic presentation and good flavor; the curried beef croquette was another highlight. 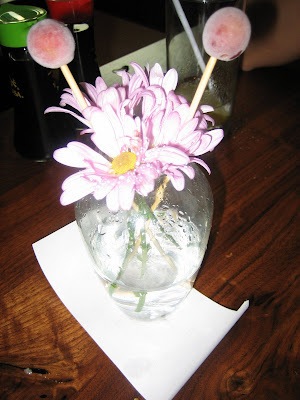 I really liked the decor of the restaurant and service was good. I might return here for drinks or the cooked food, but not for the sushi. I would also like to try the lunch specials. Nice outdoor space. The interior blends chocolate tones and interesting, tree-like fixtures to create a warm atmosphere. 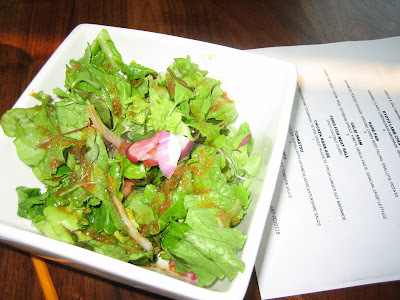 Ginger carrot salad - carrots were absent but maybe they're in the dressing? 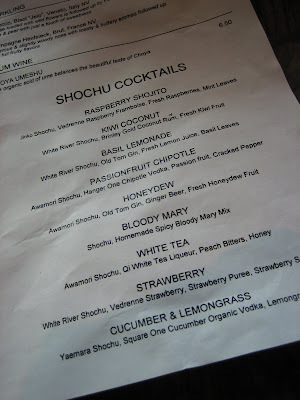 Awesome drink list - I'll have to come back to try some of these. 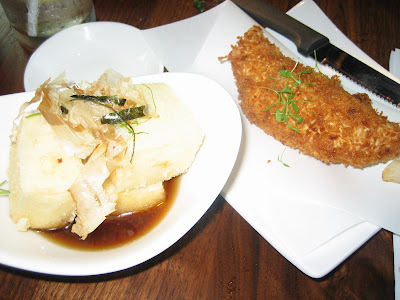 Agedashi tofu (left) and ground beef croquette. Scallop, white tuna, salmon and spicy tuna roll. 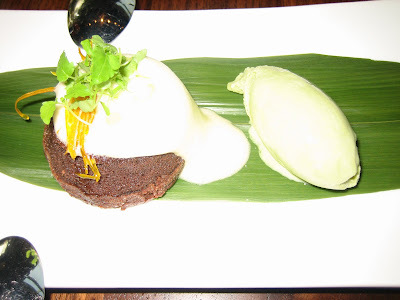 Chocolate cake with green tea ice cream - delicious, just not big enough! Recently I celebrated with friends at Sotto Sotto, the fancier next door neighbor of Fritti, both owned by Riccardo Ullio. We were seated in a corner, which was great since the tables are very close together - we ate on the early side so only towards the end of our meal did someone sit beside us. The waitstaff literally has to move the tables for you to sit on the booth side, which is fine, but could be a problem if you needed to be up and down a lot for some reason. 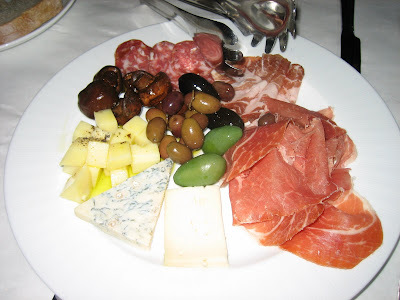 Overall I enjoyed the food very much, especially the antipasto misto platter that we shared as an appetizer. The selection of meats and cheeses tasted wonderful as did the obviously high quality olive oil served with good bread. I ordered the spaghetti del pescatore, which was good, although I wish they had a homemade pasta to go with it rather than spaghetti. The dishes my friends had were quite good also; the tortelloni was very creamy and buttery and the beet pasta with vegetables added a light, fresh touch. 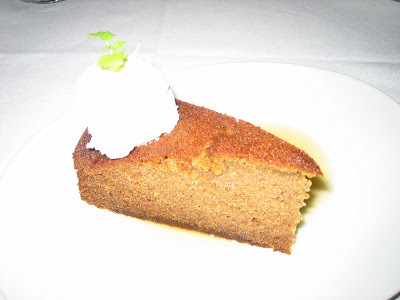 We were torn on what to try for dessert but the bread pudding turned out to be a great choice. You could spend a lot here, especially with wine/drinks. We did not venture into the "Secondi" section of the menu, which includes meats and fish. I was perfectly satisfied with the pasta and would probably stick with that again next time. This is a nice special occasion restaurant and the noise level wasn't too bad. However, if you want a lot of table room, this is not the place! 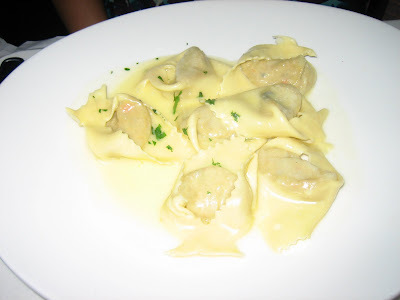 Tortelloni Carciofi - artichoke and marscapone filled pasta. 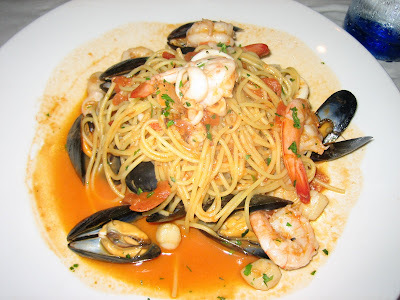 Spaghetti del pescatore - seafood pasta in light tomato sauce. 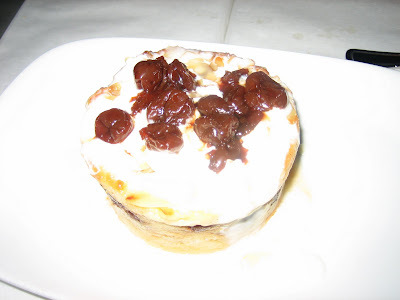 White chocolate bread pudding with dried cherries. Yakisoba Noodles with pork and picked ginger. 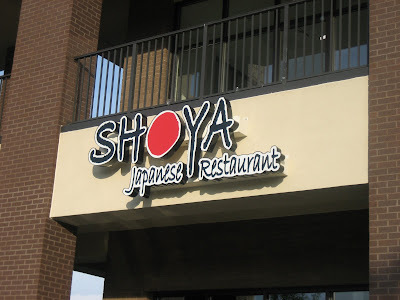 After hearing all the hype about Shoya Izakaya, I tried it last Friday. It's located behind BrandsMart USA in a new shopping center. In addition to the photographed dishes, we also tried the fried oysters, miso soup, some nigri sushi and some yakitori Japanese peppers (both delicious). 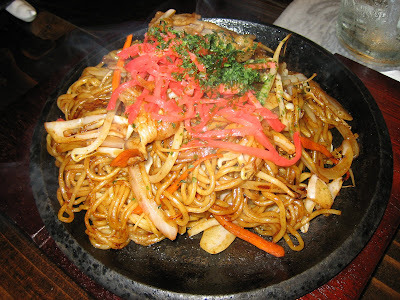 I had not tasted yakisoba since I lived in Japan six years ago (I studied abroad as an undergraduate and lived with a family in Hirakata City, near Osaka). The one problem was the this single dish took about 20 to 25 minutes to arrive; it was the last thing we ordered. Hopefully the kitchen is getting these kind of kinks worked out as I am sure this place is bound to thrive, especially with the new SuperHMart opening in the same shopping center soon. 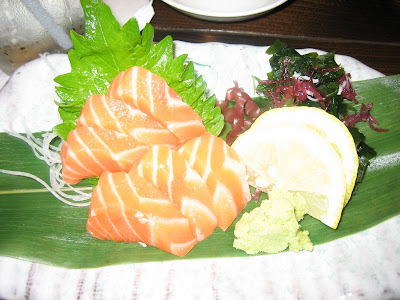 The salmon sashimi tasted fresh and pure, really hitting the spot. 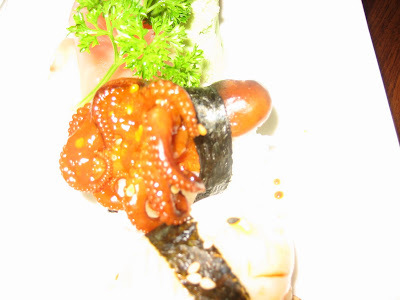 We also tried sea bass sushi, which I don't remember much about and scallop nigri, which I always love. The miso soup was fantastic - I think they use red miso instead of white as the broth had a distinct color. This is a place I would definitely like to visit again as their menu is huge (100+ items); however, it was fairly expensive - we spent about $65 for two people. After dinner we headed to Bakery Cafe Maum, which is further out Buford Hwy. than I have ever ventured before (it's actually in Gwinnett County). I did not take any photos but we sampled some delicious, fresh and not too sweet strawberry watermelon juice, some rosemary cookies (again not too sweet), a walnut tart and a cream bun. Yum! This place also has a really nice atmosphere, with a fireplace and plenty of seating. I will be back soon. 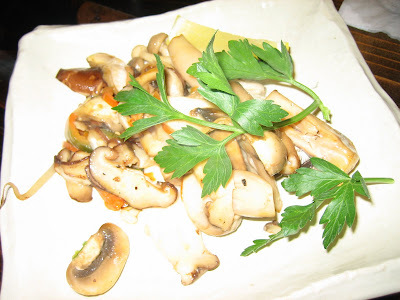 Mushrooms sauteed in jalepeno butter. 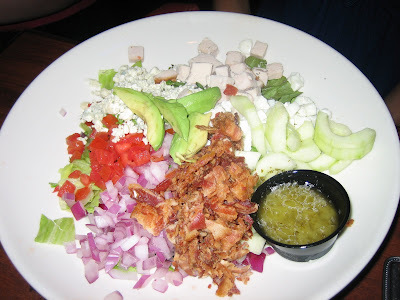 On Thursday I dined with some of my friendly neighbors at Cheyenne Grill during Thursday night trivia. 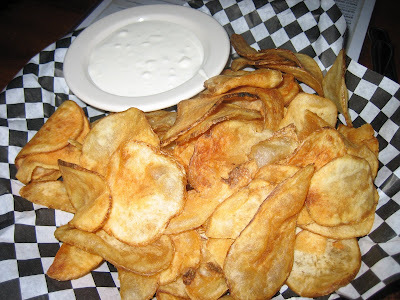 I really liked the homemade potato chips. 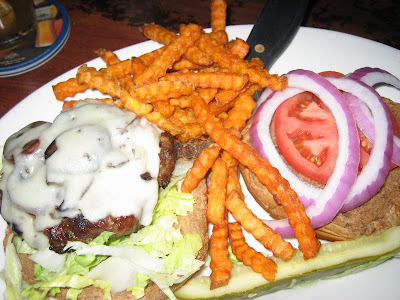 The burger was okay, but nothing great, although I did enjoy the sweet potato fries. 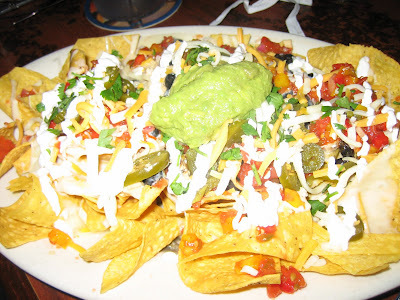 The nachos had a lot of water on the bottom, rendering the lower chips quite soggy. Otherwise they weren't bad, with lots of toppings. 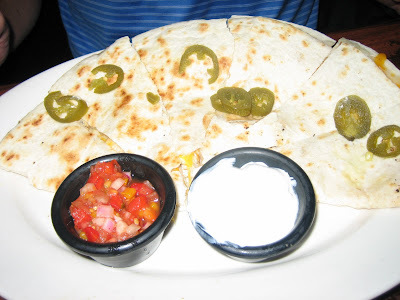 I didn't try the salad or the quesadilla - just photographed with my usual frenzy. The place was crowded and it was a little bit difficult to hear the trivia questions (to be fair, we were seated at the far end of the room away from the trivia table), but we still had a great time and I got to know some of my neighbors a bit better. I also love the trivia concept - activity while eating is good - I'd like to keep trying different places until I find the perfect place for me! Homemade chips with bleu cheese dipping sauce. Swiss burger with sweet potato fries.